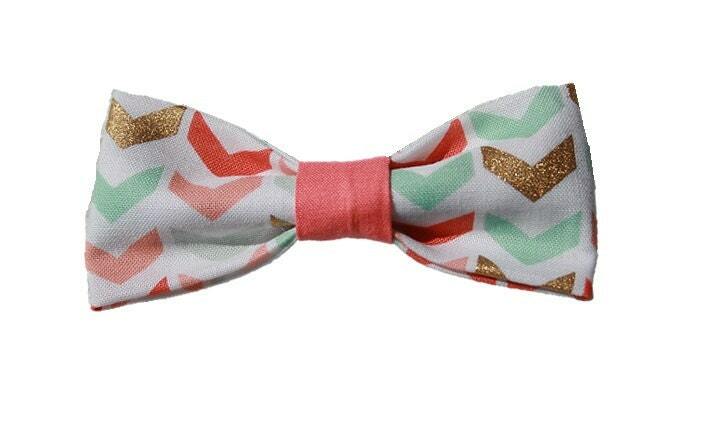 ♥ A fun addition to our lineup is our Chevron bow! Perfect for girl or boy dogs, this gender neutral quirky bow is the perfect addition to your fashion forward Fido! It features a cotton blend material with funky gold glimmer chevrons accented throughout. Shown with a Coral middle, however we can certainly customize with ANY color fabric! If you have a preference, let us know and we'll sniff out the fabric that best matches your request and custom make any bow just for you!